Escaping utility in favour of understanding. Use the quality of your hand to surround something. Touch is always with you. It is not experienced as a temporary state of sensorimotorism. Most consciousness studies tend towards a positivist, deterministic model for research. They infer findings from non-material neural strata which is claimed to be representative of experience. This neural ‘evidence’, however, is only ever drawn from selective material data. It is not my task to refute the consciousness corpus. I can only gesture towards a richer alternative that is already evidenced; does not need inventing. Experience (the core of phenomenology) tells through written description. In this we can read structures that are already present; we do not need impose, nor ‘retro-fit’, structures that justify our per-existing narratives about things. Description from first-person experience shows the ‘how it is’ of our world. 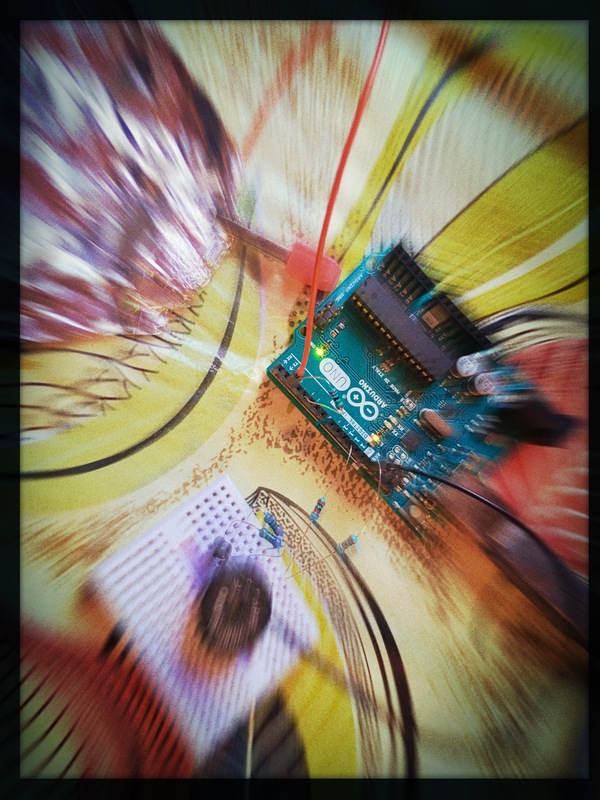 An Arduino synthesizer that uses capacitative sensors to generate tones.(Prototype). “Da-sein, that is the being of human-being…the creature whose being is essentially determined by its ability to speak” (p.22) !!! Much of Heidegger’s discussion to that point is setting up how Being (everything that is) partakes of isn-ess. But he frames that in terms of Da-sein, the being that reflects on being. So what is it about Being that it is shared by all beings, that it is not a being like others, that it is realized in Da-sein partially as reflecting on Being? I suspect that as I read on, Heidegger will argue against emminant being (beings which exist outside of time, like God, for example) and this will give force to his position of his critiques as overcoming metaphysics. A clue to a phenomenology of making, in the sense of making as the necessary element of maker-culture, lies in Heidegger’s account of appearance (p.26). Appearance can be a superficial perception of a phenomena, when the ontological ground that a given appearance rests on is one of presupposition. This could equally apply to ship wrecks, appearing on a beach(think Merleau-Ponty, here) or FMRI accounts of mind via brain activity. Each can have a presupposed nature. Appearing (real appearing) (ibid) is ”on the basis of self-showing of something”. (ibid) ‘Appearing’ can mean a process versus ‘appears’. And appearing is simply indicating what we see, or more broadly, perceive.Something appears to be, can in one sense, indicating it is partially concealed. The sense of the term reflects our perspective, including our presuppositions. Heidegger makes an appeal to Husserlian accounts of going “to the things themselves” and avoiding presuppositions. It is here that Heidegger’s turn of phrase becomes telling. Something “makes itself known”(p.26) a new thing demands a new perception of its appearance. Presuppositions can be overcome because they cannot easily accommodate this new artifact. Moreover, the maker doesn’t understand the thing until the intimate process of making is done. The materiality of a made object can overcome the propositions that describe it. And the process of making lets the maker perceive beyond the presuppositions of the object’s original design or use. This attends to Heidegger’s phenomenology; that phenomena calls for how it is to be perceived, understood, and examined. Take three phenomena of very different sorts. How we relate to a pet dog, to sadness, and to driving through the city is substantially different. The unifying factor is that in each case it is my perception, but the experience of each is very different. Prior to this qoute, Heidegger introduces being as different from other categories or genus, as any category must partake of being. None the less, we must differentiate the expression of being in the case of a horse from that of a unicorn. One is a material creature, with a history, a physical aspect that is intertwined yet separate from our perception. The other is mythical, existing in our imagination, and intertwined with history, but which has a claim to being only through imagination. And both our imagination and our perceptions are conveyed through our being. The question of what being is, and how it can realize both material objects and imagined creatures is the problem Heidegger examines. Part of the problem is that the word being can refer to a general quality, and a specific object. Moreover, in Heidegger’s lexicon, Being is specifically used to describe a being which can reflect on itself, and its place in being. To illustrate, a rock can exist(a rock is a being), but a human both exists and reflects on its existence, including its ability to reflect on its reflexiveness. This is a succinct account of phenomenology, and though of a Heideggerian slant, generally applicable to phenomenology writ large. What I would like to reflect on is the tension between how a phenomena ‘calls us’ to question it, and how we can then express that questioning. In academic writing, one approach is to prepare an experiment, then write about the hypothesis the experiment was intended to test, the methodology the experiment deployed, the results and significance of those results. Generally, the other method is to examine an existing phenomena, and then create a written description of a given phenomena, say a film, then analyze its significance in terms of the conceptual frameworks that seem most applicable. Heidegger notes that how the being of words is different from that of materiality. This raises the question of the place of words in explaining phenomena. Notwithstanding the power of words to explain some, it may be the case that the limitations of words can be overcome by other means of expression. Even within the context of words, the prose of conventional research papers is different from the the lines of a poem, or the prose of a fictional narrative. Wittengenstein’s “of that which we cannot speak, we must therefore be silent” leaves open the possibility of addressing the most difficult questions by other means than words. I am not proposing that we abandon academic prose. I am arguing that if we are to conceptualize certain difficult problems, we must address their materiality first, thus raising questions that address the thing itself, rather than our existing conceptions. This is epitomizes the notion of bridling or bracketing that is usually considered as vital to phenomenological approaches. The maker-movement often addresses aesthetic concerns in its maker’s work. As such, while artists do make, and some makers consider themselves artists, the terms are not equivalent. As such, the social considerations of defining oneself as an artist becomes rather moot, as the aesthetic considerations of a maker need not require one to become a self-styled ‘artist’. So those who see expressive practices, such as painting, poetry and film, as relevant need to their work need not define themselves as artists. This a practical response to the common comment that ‘but I’m not a artist’. The utility of this is that it encourages thinkers to engage personally with the materiality of things. The point is not to create an object that is lauded by the particular cultural structures of art. Rather it is to discover new questions. To ask a question is to ask what something is. Heidegger discusses at length the strange way that ‘is’, explicitly assumes what being is, even when we ask the question, ‘what is being?’. That philosopher’s concerns focussed on ontological questions, as to the fundamental ground of being. It has been argued that answering the question as to why there is being (Why is there something, rather than nothing) is one of the three great philosophical contemporary questions, the others being why is there life, and what is mind/consciousness. Making need not address metaphysics. But in the humanities creating expressive forms lets us engage with the questions before they are over-determined by the language used in formulating the question. And this helps us not to confuse the being of a specific word, with the being of object it attaches to. By engaging in research creation projects we can re-conceptualize certain problems by synthesizing phenomena that are not beholden to existing arguments. Moreover, we can create novel events that expand outside the internal coherence of existing argument. At the same time, we can address lived experience that is often elided by typically reductive and abstracted experiments. I owe the stirrings of this argument with the works of several different authors. Alva Noë’s book, Strange Tools, John Kaag’s Thinking through the Imagination, serve to join Dieter Mersch’s Epistemology of Aesthetics with recent work by Rilla Khaled, Pippin Barr, and Jonathan Lessard. Khaled et al argue for recoverability rather than generalizability as a virtue of research /creation (practice-based) research. This resonates with Andrew Murphy’s discussion of cloning technics—making experiences broadly available to researchers, and encouraging a discussion of observed variation. This notion of developing an understanding, or meaning, regarding the variation of an experience is a characteristic of existential phenomenology. To define what something “is” we imagine how many elements can be varied before an phenomena becomes something else. It seems to me that such imaginative variation has to account for linguistic effects, that is how we define phenomena through language. This includes the limitations of a lexicon, vagueness within language, up to the post-modern critiques of the limits of language and reason. Concurrently, cultural biases have to be accounted for. Our conceptions of ontological and metaphysical questions are built within cultural structures. Language, institutions, academic disciplines, received history and so on. Moreover, these elements, as we perceive them, are always conditioning our perspective. If culture has an ontological basis, then culture itself is an ontological feature, as is its self-perception through the actors that embody it. It is this sense of bodies as conveying culture, knowledge that leads us to think about creating aesthetic objects as a route to knowledge. Moreover, it is knowledge of gaps and inadequacies. It is a knowledge of questions unasked, or even unthought of. Yet at the same time, these questions are rooted in a materiality that is difficult to ignore. Dr.Johnson’s kicking a stone was meant as repudiation of Berkeley’s idealism. In reality, it is better thought of a as flawed example of performance art. Flawed because it stemmed from a misunderstanding of Berkley’s thought(who argued for ideas requiring a mind, not for a radical immaterialism). Berkeley would have agreed that we could feel the stone. But this is almost a proto-phenomenology, and would have echoes in Merleau-Ponty’s work in the Phenomenology of Perception. Merleau-Ponty asserts that a theory of the body is a theory of perception. This requires an account of aesthetics that I’ve not yet completed. But the intrinsic quality of meaningfulness in having a fleshy body, in phenomenological critique, and in aesthetic experience, leads me to think that at least some more profound questions and insights may be found in research-creation projects. A table built by graduate students, using reclaimed wood, for Concordia’s Ethno-Lab. Listening to George Adamson, an art historian, being interviewed by his twin brother, Peter Adamson, a philospher, about material intelligence. Material intelligence is in Adamson’s view the ‘tacit knowledge’ gained by working/interacting with a given material. He points out that planing pine is different from planing walnut, for example. In addition, each piece of walnut will be slightly different requiring a certain adaptation and sensitivity to each specific object. He points out this sensitivity cannot be learned through words, or even demonstrations. It requires repeated sessions directly in contact with the wood. He argues that we have much less ‘material intelligence’ than past generations because (modern) technology places us at a remove from materials. He asks to think of the social, ethical, political, and technical relationships that produce a chair. It is here that I think Adamson’s arguments can be turned towards a political phenomenology. In my case, this tacit knowledge of physical material has a parallel with the tacit knowledge that underlies empathy. How empathy arises is unclear, as is the what constitutes empathy. Yet we tacitly recognise another, and have a sense of what they are thinking and feeling. Adamson goes onto explore Aristotlean conceptions of knowledge to consider ethics as a craft. Craft is specific to a given example of this singularity, and that meaning has resonance with phenomenology as ‘the meaning found through the experience of perceiving something’. G. Adamson, Thinking Through Craft (New York: 2007). • G. Adamson, The Craft Reader (London: 2010). • G. Adamson, The Invention of Craft (London: 2013). • G. Adamson, Fewer, Better Things: the Hidden Wisdom of Objects (London: 2018). Experience the presence of another while engaged in a game of tug of war. How is empathy(Einfühlung) conveyed by proprioceptive senses? Specifically, what are the proprioceptive (the sense of bodily position and movement) qualities of our experience that indicate to us that we are engaged with another person? What-it-is-like-to-have-an-experience, and what meaning is conveyed through that experience, characterizes the variegated field of phenomenological research. What are the reasons for looking at proprioception? What are the reasons for looking at tug of war? Why is it important to know the answer to this question? It is very hard to let go of the background issues; what are Aesthetics of play, what is the relationship of creative practices to research, what is mind? 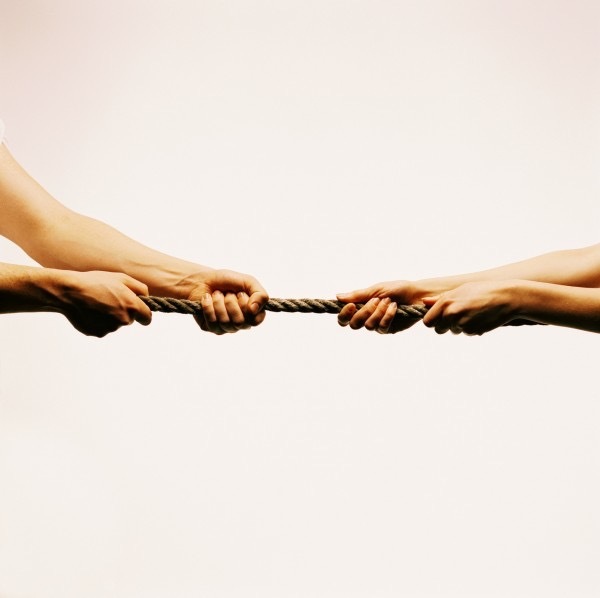 What is it like to experience the presence of another while engaged in a game of tug of war? Van Manen compares cognitive and non—cognitive meanings. He contrasts, for example Jean-Paul Satre’s Being and Nothingness a with La Nausée. Being and Nothingness conveys its arguments propositionally, and could conceivably have the text radically changed without necessarily altering the meaning. On the other hand La Nausée conveys an experiential form of meaning, a meaning that is dependent on the precise choice of words. Van Manen doesn’t overstate his case, as his emphasis is on the way poetics create meaning. While poems, plays and novels take up the same themes, the quality of meanings conveyed vary subtly and significantly from one work to the next. This is less of an issue, for van Manen, when a text is seeking a logical analysis of a given problem. The very indirectness of deliberately poetic texts allows them to better reveal the specific experiential meaning of lived experience. This in turn creates the opportunity for phenomenological research which he characterizes as the unknown knowns. For example, the ease with which we go about performing our daily activities, such as picking up and drinking from a coffee cup, tying our shoes or returning home from work. Merleau-Ponty offers the example of Schneider, a man who, due to a brain injury, cannot learn new actions, and must observe himself in order to consciously perform actions. But there always seems to be some aesthetic element to any text. Van Manen accepts this, pointing out how that Heidegger would annotate his lectures, emphasizing words or passages with specific intonation or gestures in order to convey his argument. This is tending to support my idea that play and aesthetics undergird cognition. Merleau-Ponty, Maurice. Phenomenology of Perception. London: Routledge, 2012. Van Manen, Max. Phenomenology of Practice: Meaning-Giving Methods in Phenomenological Research and Writing. Developing Qualitative Inquiry, volume 13. Walnut Creek, California: Left Coast Press, 2014. Part of my goal with this bridling journal is to force myself to write everyday. Obviously, my previous first entry was over two weeks ago, so more application is involved. First, my context, this week: My dissertation proposal hangs over my head. My process is to extract my supervisor’s comments from the previous draft, along with the text these specifically address. I will then analyze them and address them globally to the themes they reveal to me. I also intend on giving a subheading to each paragraph, so that they have a point to address, and I can tighten up the overall structure. Developing writing techniques are important, but this is a skill that requires practice, so writing everyday on my topic, or at least, around my topic, will help. I’ll add the nifty jpegs and gifs that I have taken from Write That PhD, GradHacker, and similar social media sites devoted to grad school. I’m hoping that in a few months my writing will improve in regards to clarity and precision. Even now I feel like I question whether to continue with this project. But I have eliminated all other career possibilities, outside of artist, academic and consultant. Earning a doctorate can only help with those goals. Moreover, I do not want to regret not finishing. Still, I am planning for a post-aca career, with part-time lecturing, part-time research/creation and consulting as appropriate. This doctoral work is rewarding unto itself, and can only help with my ongoing activities. I will apply myself to reading at least a book chapter and a journal article each day. I am going to add to my bridling journal, and write reflecting my actual project, or something ancillary about it. The bridling journal will be a subjective reflection on my process. Other entries will more directly address the research, it’s theoretical, methodological, and practical implementation. Being disciplined, doing the right thing at the right time will move me ahead with my doctoral research. I must maintain that discipline. Bridling is a methodological element in phenomenological research. It is the ongoing process of considering critically one’s own theoretical, social and ‘positional’ commitments. What do I believe is true or accurate? Why? How has this evolved? how does this relate to the meaningful phenomena that I am examining? I owe my introduction to this ongoing methodological process to Prof Warren Linds at Concordia University, and the work of Dr. Mark D. Vagle, Dr. Karin Dahlberg and those they have co-authored books with. Do we learn first principals or skills first? ‘Scientific knowledge’, broadly construed is usually starts from individual points of data, which themselves are collected artfully, which are then analyzed and from which a general principal is drawn. Presumably, then, the principal is better learned and understood by gathering data(reinventing the wheel) because that is how our mind gathers knowledge. This is especially true of philosophy, because, following from pragmatists and phenomenologists, meaning arises through and from lived experience. Teaching philosophical principles is difficult to understand without addressing the experience that these arose from. Internally consistent principals may resist counter-arguments, but not counter-experience. To be sure, one of those experiences is to encounter events that are counter-intuitive. If I were to be flippant, know-it-alls and short-pants snobs, have a wealth of arguments, but ultimately they have simply been socialized into a lexicon. This is a call to consider academic generosity as a methodological principal, and regard the limits of rationality as a bridle, rather than a license. The growing body of research that describes cognition as embodied, enacted, embedded and extended seems to run counter to the post-structuralism of the late Twentieth C. Then, knowledge was seen as arising almost wholly from arbitrary symbolic systems, such as language. The body was seen largely as a symbolic construction, a product of knowledge systems. As such, the phenomenology of philosophers such as Maurice Merleau-Ponty was seen to be too limited to a particular symbolic value of the body to be of great relevance. The recent return to the body as the primary instrument of knowledge, albeit understood to be subject to a range of cultural conditioning that both directs and elides the relationship of the body to the lifeworld reflects the recognition of the limitations of interpreting the world as a purely symbolic structure. I suspect critique may have arisen at this time may have something to do with the difficulties in creating artificial intelligence using typical computer algorithms. After all, if a computer cannot be made to think using arbitrary symbols, as Searle’s Chinese Room though experiment argues, then knowledge must be found or based in something else. Charles Saunders Peirce, went from studying formal logic, into founding the modern discourse on semiotics, to finally exploring the tacit logics afforded by the body. I will jump ahead here, and suggest that if symbols are given meaning by the body, a corollary of Pierce’s later work on abductive logic, and logic itself is a semiotic system, then we can hypothesise that logic arises from our body as always/already in the world. The tacit knowledge that Polanyi talks about is one facet of this embodied logic. The ‘knowing how’ that can only with often great difficulty be translated into the ‘knowing that’ is a feature of tacit knowledge. The logic by which we grasp of, function through, and relate to the lifeworld in which we are finding ourselves minutes by minute and life-time through life-time reflects our specifically fleshy body as a continuum of the life world. Logic reflects the decisions of how we grasp the world that we are intrinsically a part of, and is not an external algorithm imposing meaning on us. Thus Peirce’s thought followed a trajectory that I argue found that abductive logic, the empirical logic of the imagination, was the logic that sprang from the body coping in its life world. This concept of life world includes the body not just as an atomistic object but intrinsically embedded in the world around it. The term continuum or plenum well characterize this view of the body-world relationship. The body is part of the world around it and speaking of the body as a separate entity reflects the problem of language being inadequate to describe much of the lifeworld which we skillfully cope with. Ethnographic descriptions of craft work often describe how knowledge is passed wordlessly between craft workers, either to coordinate the making process, or to mentor less experienced members of their craft community. The translation of ‘knowing how’ to ‘knowing that’ in that particular situation is often supported by the body of tacit knowledge (or the tacit knowledge of the body?) so that, to paraphrase Louis Armstrong “We don’t have to ask what jazz is, we already know”. This poses particular problem when conducting life world research;we already often know(how) to do something, to the point where it seems trivial to discuss such experience as ‘knowing that’. Framing tacit knowledge with expressions like ‘It seems to me’ or ‘it works for me’ or ‘that is how we do’ it appears inadequate to scholarly exegesis that favours the conceptual, the propositional approach of ‘knowing that’. Yet these expressions reveal skilful coping that does work, and that reflects a successful experience of being in and of the world. This is also the problem that we do somethings so well they are invisible–yet we would never argue as scholars, that these things are not important. Thus my own current focus, on presence, or what is sometimes called social presence, reflects our common experience of being with another self-aware entity, and experience that as yet remains unexplained as to its origins and underlying operation. I suspect that clues to moving from the ‘knowing how’ to ‘knowing that’ of presence will lie in gathering phenomenological accounts, which focus on the embodied and enactive experience of responding between oneself and another. The methodological issue will be how to bring forth an account of an experience that is fundamental to our life worlds, fundamental to the degree that it is almost transparent. The ‘I’ and ‘Thou’ relationship is imbued with an intertwining, yet we must in practice conjecture what the relationship means to the other, the ‘thou’ with whom our relationship reveals itself. Imperfectly ‘knowing that’ as to the other’s internal life, yet generally skilfully ‘knowing how’ to respond and grasp the other in relationship. How is such a relationship possible? perhaps by gathering accounts of this experience we can begin to describe the ‘knowing that’ of the sense of presence that underlies ‘i’ and ‘thou’. Can aesthetic methodologies offer answers where purely deductive (rationalistic, idealist) and inductive (empirical, positivistic) logics cannot? Mark Vagle argues that phenomenological research must be crafted(craft or cræft implying a responsive, singular and wholistic wisdom) along the way, moving between theory and data gathering. How can rigour be realized in this framework? How can participant accounts be elicited such that they directly address their own experience, and not fall back into what amounts to cliches, or appeals to prior experience? This is especially challenging because we don’t usually question the ‘presence’ of another;it is assumed. What is the ontological relationship of aesthetics(tentatively defined as the related experience between sensation and affect) to cognition? Authors such as Dieter Mersch argue that aesthetics undergirds cognition, so cognition is a product of aesthetics. This challenges Kantian notions of aesthetic experience as disinterested and aloof, in favour of resting in the lifeworlds of fleshy bodies. If logic is an epiphenomena to the body, which is the apparent trajectory of both Peirce’s and Merleau-Ponty’s later thinking, then explaining cognition primarily in aesthetic terms seems to better address what it means to have cognition, and hence experience, defined as the bodily knowledge of being aware of the world including one’s own awareness as part of that world. Langlands, Alexander. Craeft: How Traditional Crafts Are about More than Just Making, 2018. Kaag, John J. Thinking through the Imagination: Aesthetics in Human Cognition. First edition. American Philosophy. New York: Fordham University Press, 2014. Mersch, Dieter, and Laura Radosh. Epistemologies of aesthetics, 2015. Polanyi, Michael, and Mary Jo Nye. Personal Knowledge: Towards a Post-Critical Philosophy. Enlarged edition. Chicago: University of Chicago Press, 2015. Searle, John, “Minds, Brains, and Programs.” Behavioral and Brain Sciences 3, 1980, p417-424. Vagle, Mark D. Crafting Phenomenological Research. Walnut Creek, California: Left Coast Press, Inc, 2014.